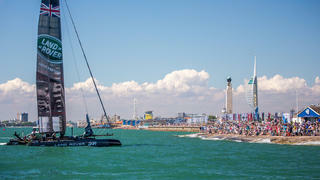 The Louis Vuitton America’s Cup World Series returned to Portsmouth over the weekend, with Ben Ainslie’s Land Rover BAR delighting the crowds with a dramatic victory to take the top spot in the overall leader board by a single point. The home team won three out of six races across the weekend to make it three World Series wins out of seven so far. Land Rover BAR’s victory was by no means a procession — they had to fend off late pressure from arch rivals Oracle Team USA, who started slowly, but grew into the weekend. 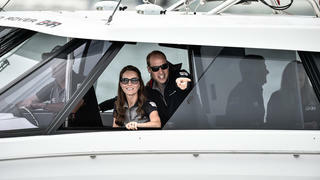 The Duke and Duchess of Cambridge boosted attendance at this year’s America’s Cup World Series Portsmouth, with the royal couple boarding the Land Rover BAR chase boat for the dramatic final day of racing. Their attendance was a real draw for the thousands of local spectators. 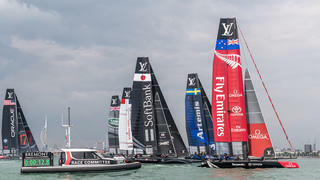 The upcoming Rio Olympics meant a crew reshuffle was needed on many of the boats at the America’s Cup World Series Portsmouth. 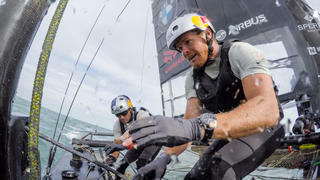 The most notable change was for Artemis Racing, who drafted in celebrated Italian sailor Francesco Bruni for absent skipper Nathan Outteridge. It wouldn’t be an America’s Cup World Series event without some spectacular entertainment and Portsmouth did not disappoint. 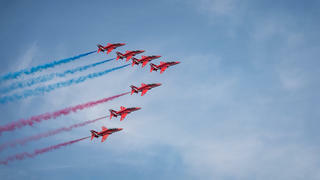 Legendary RAF stunt team the Red Arrows kicked things off with an extended routine on Friday (July 22) before the Blades Aerobatic display team continued the theme on Saturday. Visitors on Sunday didn’t miss out either, with the Red Bull Matadors putting on a 15-minute aerobatic performance to thrill the assembled crowds. It wouldn’t be an America’s Cup World Series event without some spectacular entertainment and Portsmouth did not disappoint. Legendary RAF stunt team the Red Arrows kicked things off with an extended routine on Friday (July 22) before the Blades Aerobatic display team continued the theme on Saturday. Visitors on Sunday didn’t miss out either, with the Red Bull Matadors putting on a 15-minute aerobatic performance to thrill the assembled crowds.